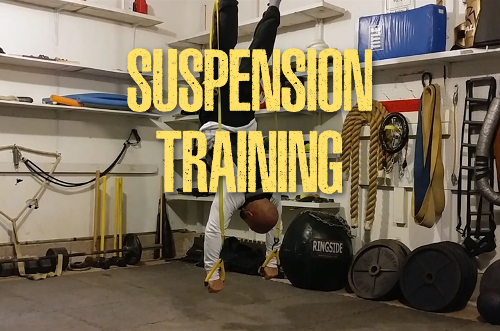 I recently shared a suspension training video where I demoed some of my favorite variations using an inexpensive, homemade model. Since sharing the video last month, I’ve received loads of questions about my suspension trainer and how it compares to commercial models. With that in mind, I’ll use this entry to discuss some of the differences, as I don’t always favor homemade equipment. It just happens that I’ve had a homemade trainer for 10+ years so that’s what I’m accustomed to using. Before discussing the specifics, you’ll find the previously referenced video below. As you’ll see, there are loads of exercises that can be performed with a suspension trainer. When discussing homemade equipment, it’s worth noting that I am creature of habit. Once I have something that works, I don’t seek out additional options. That’s definitely been true with my old suspension trainer. I created it because the commercial models (at the time) seemed overpriced to me. Once I had a working version, I never looked back. As for the specifics, my suspension trainer consists of a sturdy set of cam buckle straps and a pair of playground ring handles. Eventually, I also added foot straps with a set of Husky Hang-Alls . My suspension trainer is quite similar to one of the original old school models. 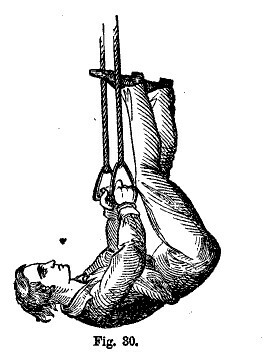 The image below comes from an 1866 text (Athletic Sports For Boys). Perhaps I’ll sound strange for saying it, but I think it’s neat to be working with a device that’s similar to what athletes were using 150+ years ago. It was challenging then and in continues to be challenging today. Very little has changed in that regard. One thing that has changed is the availability of suspension trainers. There are now numerous suppliers which has led to lower prices. Amazon has also evolved. It’s possible to order something today and receive it tomorrow. That type of convenience didn’t exist when I first made my suspension trainer. Therefore, if I had to do it over again in 2019, I’d probably purchase a commercial model online. If you scan through the link below, you’ll find several options in the $50 price range that have positive reviews. An added plus is that you won’t need to purchase separate handles and foot straps like you would with a homemade model. Everything is included. Ultimately, whether you opt for a homemade or commercial suspension trainer, there are loads of exercises that you can perform. And that’s the real reason I created this entry (and the video above). I’m not here to steer you towards one brand or another, but I can show you what’s possible with the tool. I’ve used my suspension trainer for over 10 years and it’s still challenging and useful for me. It’s not something that anyone will ever outgrow. As with most bodyweight movements, there’s always options to increase the difficulty. 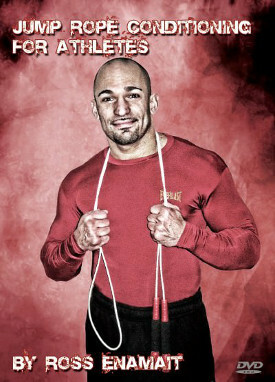 Thus, if suspension training interests you, find a model that suits your budget and try some of the exercises above. I am confident that you will enjoy them. Ross your a freak! And I mean that in a good way ! Great post! Thanks again for the content Ross. Iâ€™ve watched your training videos many times and I always tend to learn something new, be it a movement or the manner in which you perform it. Just did a nice neck workout today and Iâ€™ll be using my suspension trainer outside in the cold tomorrow. Thanks again for the inspiration.